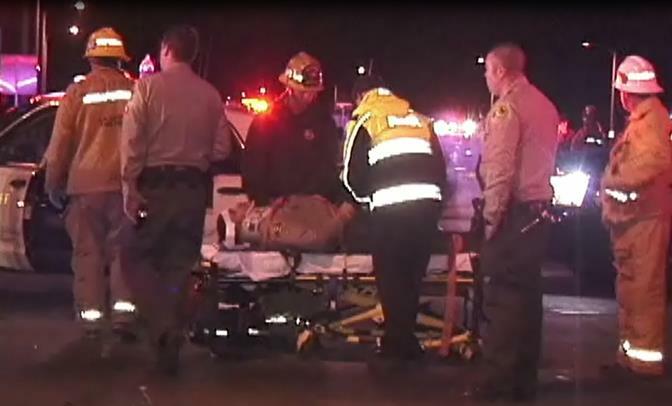 On January 13, 2014 (Monday) at approximately 1:40 a.m., a deputy from the Palmdale Sheriff’s Station was involved in an on-duty traffic collision on East Avenue R at the intersection of 47th Street East, in the city of Palmdale. The preliminary facts of this investigation indicate the deputy was stopped for a red traffic light on westbound Avenue R at 47th Street East. While stopped for the red light, the deputy was rear-ended by a 1995 Honda Civic driven by 23-year-old Christopher Perez. Upon impact, the deputy’s vehicle was pushed into the intersection. Due to the force of the impact and the long skid marks left by Perez’s vehicle, it was determined Perez was traveling at a high rate of speed prior to the collision. The deputy received minor injuries. Christopher Perez was not injured. There were no additional passengers in either vehicle. Both vehicles sustained moderate damage. Christopher Perez was arrested on suspicion of driving under the influence. 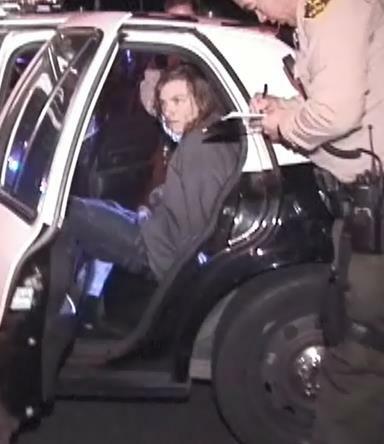 He was booked at the Palmdale Sheriff’s Station with a bail amount of $5,000.00. Perez, a Lancaster resident, was released from custody around 8:35 a.m. Monday, with a court appearance set for March 13, according to LASD inmate records. The deputy, whose name was not released, was transported to the hospital with minor injuries. He is expected to make a full recovery. The incident remains under investigation. 23 comments for "Driver rear ends patrol car, DUI suspected"
California will never take Drunk Driving seriously. Think about it! The law literally states, ” It’s OK to put a “Mind Altering Drug” into your body and then make a conscious decision on if your safe to drive. DUH!!! If California were serious, it would adopt a ZERO tolerance level. You shouldn’t drink & drive anyway since California has most of the worst/untrained drivers in America. Can you say “mouth swab”? There are counties in California that are doing mouth swabs at the DUI checkpoints and they work great. Why don’t we? I think Cali takes DUI’s seriously. This looks like a kid that made a terrible mistake, but he’ll face some pretty serious repercussions. He’ll get heavy fines, drug classes, an interlock device, loss of license, huge spike in insurance when he goes to drive again, plus the public humiliation. Just a couple of days ago it was a woman who was drinking and ran into the back of a fire truck, now this dud!! Both wee hours of the morning…. Guess we all need to be safe at home by 10pm…..way before the bars let out. Hope they are both sent to jail…. I is sad that so many these days have no other alternative to express their inner ‘demons’ than to inflict harm on themselves and others. Shootings everywhere, most by fatherless children on prescription drugs, depressed women, and vices such as drugs and alcohol. Appears to get worse and worse every year as society loses the acceptance of personal responsibility. I bet he wasn’t under the influence that’s why it says suspected DUI I’m pretty sure it would say he was under the influence not suspected. And innocent? I wouldn’t say a member of the lasd is an innocent person. It is common practice for new stories to say “suspected” since a person is presumed innocent until proven guilty. Otherwise there could be a defamation lawsuit if the suspect was later found innocent. The streets here are not bright enough and speed limits are too high. Also, driving is hard. LOL,hope the deputy is o.k..
speed limits are not too high. go move to the city if you prefer driving at a snails pace. I live within 1 mile of that intersection, it is very well lit. Both those streets have streetlights as well. Another Untrained Driver ! Driving is Hard? Other Drivers that do not pay attention along with Intoxicated drivers and drivers with zero respect for anyone else that may be using the roads. Do Not Belong on the Road At All. If you can’t drive then DON’T. Sobered up and paid his bond I guess. Another Miracle on 47th street. They are both lucky it wasn’t much worse. This could have easily ended with Perez killing an innocent person by blowing the stop. It’s time for California to stop putting up with these horrible drivers. California is not putting up with them, did you miss the part where he was arrested and given a court date to face his charges? And, if the history of similar sentencing shows, he won’t serve any time in prison, limited probation, and will be on the road in under a year. The State of California is the only State where a DUI Remains on your Driving Record for 10 Years. So why are all these people making statements about something that they know nothing about? Do the research before spouting off. So this stays on his record for 10 years. So what…he’s probably already out driving again. Someone else’s car, a rental, a new junker off a lot. Just because it’s on his record doesn’t mean he’s not going to drink and drive. Look at how many people are repeat offenders of that charge. Never surprises me when the trials or news stories release how many other driving charges these people have. Usually that info doesn’t come out until they kill spmeone and everyone is outraged. DUI of any substance that alters perception and ability, should be prosecuted.